The past, the present, the future. Much has been professed about time. Countless idioms contradict themselves regarding the importance of time. Does history repeat itself? Should I live for today? Is tomorrow a new day? The answer to all these questions is yes! The following is an update of the past, present, and future of Hero Holds. 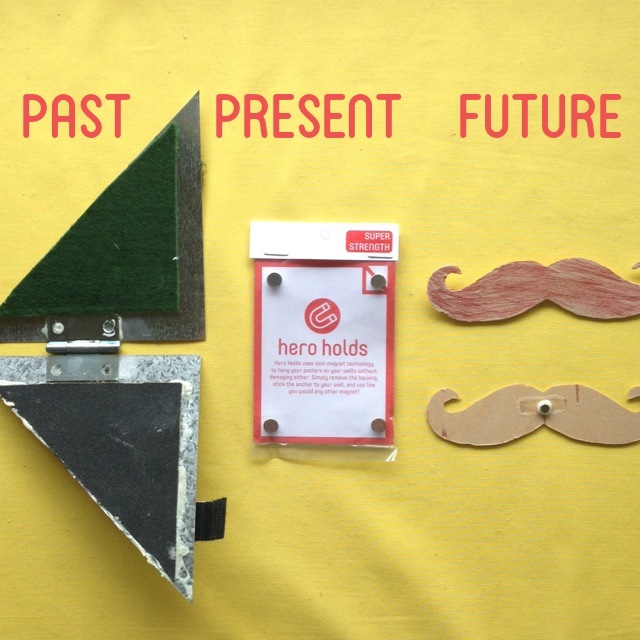 The future of Hero Holds will bring new, innovative ways to express yourself. Designs, colors, brand logos, custom mini photos-all of these can be added to the corners of your art. Close your eyes and picture the world map in your office hung with Hero Holds. In each corner is a small photograph from your last trip to the Bahamas. Swap those pictures out when you get home from your next trip. Keep your living space fresh. We’re also dreaming of matting that is compatible with Hero Holds. Give your college degree the formal appearance it deserves and still avoid the frame and holes in the wall. The design and technology behind Hero Holds is sound, but there are countless ways for us to reinvent the brand in the future. The present. A gift. Hero Holds has been extremely fortunate to have so much support. From product tests to brainstorming sessions to this Kickstarter campaign, I’m grateful for everyone who has been a part of the process. Personally, I take the most pleasure from the daily interactions with customers, partners, and friends. Hero Holds is a product, a solution, but also a vehicle for me to have fierce conversations with others. Currently, we are at 37% funding for our Kickstarter campaign. We have 11 days left to reach our $12,000 goal. We’re not on pace, but there’s still hope! We’re getting media coverage later this week. We’ll continue to tell our story in the coming days. The past. A closed book. Available for us to study and learn from. Let me share with you a pattern I’ve noticed from my past. I have been afraid of failure. I grew up playing sports and am pretty competitive. I like playing games I can win! A fear of failure is unhealthy. I recognized it and didn’t like it. I would like to think I’ve overcome this fear a bit, though. I mean, exhibit A, look at that first attempt at a Hero Holds. That clunky device didn’t cut it. It was a total fail. It’s laughable. But it makes me smile for more reasons that just its shortcomings. We burned through dozens of prototypes, brand names and design ideas to get to today’s Hero Holds. As of now, Hero Holds provides a brand new, superior poster hanging solution that can’t be achieved using any other device. As they say, the future is unknown. I couldn’t be more excited about the next 11 days. Today is the day for you to reach out to those who should know about Hero Holds. 100% of your friends want to save time and money. According to our surveys, 100% of our customers have been pleased with their Hero Holds. We have 11 more days to dream big and try to bring this Kickstarter campaign to its funding goal. If it’s anything like the last 30 days, it’s going to be fun! We have reached 29% of our funding goal! We are also 29% into our campaign time frame. Talk about right on schedule! There is one issue. We won't be sending anyone rewards unless we hit 100% of our funding goal! This campaign is all or nothing. I'm not saying you HAVE to share this project with all of your rich friends. If you feel inclined to do so, great. Here's what I AM saying. Hero Holds users are smart, forward-thinking, and creative. You value your time and money, and Hero Holds saves you both time and money. Do you know other like-minded people? Those are the folks who should know about our community. Please tag, call, or email them about Hero Holds right now. You see, Hero Holds' strength is also its weakness. Its strength is that it is a brand new idea. It's a new, superior solution to an old problem. Its weakness is that it is a foreign and unfamiliar idea. People don't know what it is until we tell them. We have 30 days to change the world! This campaign is really important. I need your help. Donate $100 to our campaign. Share our link. Follow us on Facebook, Instagram and Twitter. I know it's hard to be the first person to try something, or be the first person talking about Hero Holds. But you can talk about Hero Holds and be cool and confident. It's what you do, you smart, forward-thinker! I appreciate you! You make things possible. We know that you value your time and money. We value your time and money too. With Hero Holds, you can hang your favorite poster in less than a minute, and at the same time save a bunch of cash. Out with the old and in with the new. Hero Holds is the only poster hanging solution that is easy, versatile, and cost-effective. Check out how Hero Holds is the sole option in its quadrant. You deserve to have all those posters hung. It shouldn't require a lot of your money, and it shouldn't require a lot of your time. Create that living space that you've always dreamed of. Invest in Hero Holds now. Hero Holds will save you time in the long run, and it will empower you to make your home your castle. The Trio Package is a great starter kit for new Hero Holds users. Available exclusively through our Kickstarter campaign, receive 16 Super Strength Hero Holds and 16 Original Strength Hero Holds to hang up to 32 of your favorite prints. You'll also receive 16 Replacement Anchors, giving you the liberty to relocate your prints. Indeed, all good things come to an end. Frames, push pins, and double-sided tape have gotten us a long way. Hero Holds is a better way to hang your stuff. Donate now and please share with your friends. On a dark, warm night, frames were destroyed. People gathered round. In the middle, wood. Paper matting. Glass. The old accomplices. Bystanders threw in their pushpins and rolls of tape for good measure. People were tired of dealing with these age-old, inferior poster hanging systems. People were ready to usher in a new era. A new hope. Oh boy! So dramatic! It actually went down much more casually than all that. Hero Holds made live its Kickstarter campaign on Sunday, January 25 at 11a. The event will run for 6 weeks. Make sure to back our event by Sunday, March 8 (daylight savings!) at 11a. Twenty-five of our closest friends and family gathered to check out our project. They also got to speak with us, which has been a little rare. You see, we've been working on Hero Holds so much, we haven't been out and about. The launch party was great. We enjoyed drinks, homemade pizza and a Hero Holds cake, and great conversation. We hosted an artist competition. Alyssa and Erica won Hero Holds for their fun work (images to come). Ultimately, we asked everyone to share Hero Holds and our Kickstarter campaign with their network of friends. Our friends didn't disappoint. Sunday night and Monday morning, Hero Holds posts flooded social media sites. We've gotten off to a really nice start. Keep it going!